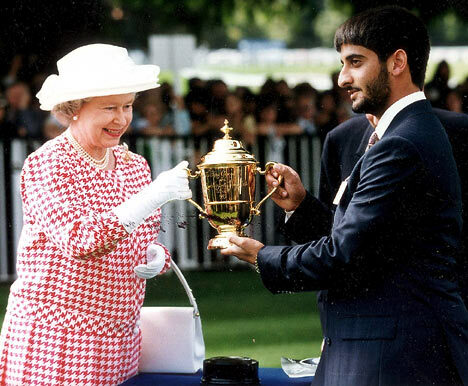 Queen Elizabeth II presents the trophy to Sheikh Saeed Al Maktoum in 1995. The Royal Ascot is another glittering event highly anticipated both by horseracing enthusiasts and, well, anyone who wants to catch a glimpse of the Royal Family. The five-day horse race is actually one the biggest society events of the year in the UK and it’s been going around since 1711. The 2018 Royal Ascot has seen yet again Her Majesty with her timeless fashion sense. She was dressed in a bright yellow outfit while heading the carriage procession as Royal Ascot kicked off. However, she came without Prince Philip and is, instead the Queen is joined by the Princess Royal, the Duke of York and Lord Vestey. The Princess Royal looked delighted following the birth of her fourth granddaughter. Here’s the complete carriage list of the royal who joined in this year’s Royal Ascot: First Carriage—The Queen, the Princess Royal, the Duke of York and Lord Vestey; Second Carriage—The Prince of Wales, the Duchess of Cornwall, Princess Beatrice and Princess Eugenie of York; Third Carriage—The Duke and Duchess of Sussex and the Earl and Countess of Wessex; Fourth Carriage—Prince and Princess Michael of Kent and Lord and Lady Mauley. The Duke and Duchess of Sussex also attended the Ascot. This is the duchess' first time since becoming a member of the Royal Family. The Internet went abuzz after it was reported that the Duchess of Sussex was seen not wearing a name tag. Strict dress code in observed and ladies are required to cover their shoulders and wear hats and name tags. However, the Duchess of Cornwall, Princess Anne, Princess Beatrice and Princess Eugenie also went without wearing one, anyway. The Duchess of Cambridge skipped this year's horse raise because she is still on a maternity leave after giving birth to Prince Louis last April. Prince William was also not around for another royal duty.